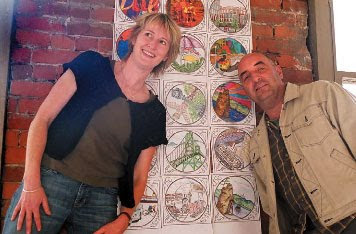 Liz Calvin and Bruce Walther are lead artists for the Mosaic Art Tile Project, which has embedded 18 colourful mosaics into the sidewalks of downtown Vancouver. The pair later learned they had an important connection. 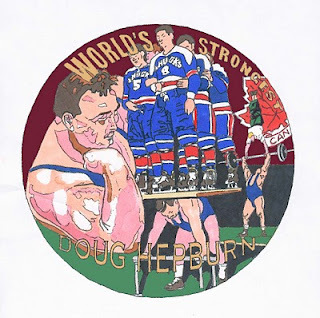 BELOW: Bruce Walther's design for a mosaic honouring Doug Hepburn, the World's Strongest Man. In the crush of a crowd on a downtown Vancouver street, I noted with horror the position of my right foot. I was standing on Dal Richard’s head. Not that the nonagenarian band leader was complaining. A tile mosaic embedded in the sidewalk on Georgia Street features the bandleader. It is near the front entrance of the Hotel Vancouver, where he was longtime bandleader in the rooftop Panorama Room. “The Swing of Things” is one of 18 street mosaics commissioned by the Downtown Vancouver Business Improvement Association. These can be found scattered around the commercial district, like colourful manhole covers. Sidewalk mosaics: Taking art to the next step. Or, taking the next step to art. The spectacular pieces are the work of Liz Calvin and Bruce Walther, lead artists for the Mosaic Art Tile Project. During the Olympics, they could be found in a Granville Street storefront at work on new mosaics. Mr. Walther had a knife in his hands and a stock of colourful bits of tile at his feet. The mosaic on which he was working was in its earliest stages, the outline drawn but only a few bits of tiles in place. The artist turned 52 last month. He is a soft-spoken man whose grinning countenance and stubbly appearance hint at some inside joke, all of which makes him resemble the British comic Alexi Sayle. Though formally trained at Langara College and what is now known as the Emily Carr University of Art and Design, Mr. Walther credits an art teacher at John Oliver Secondary for showing him the possibilities of art as a life. The subject of the mosaic on which he is currently working was inspired by a visit to a barber shop near Victory Square some two decades ago. Mr. Walther noticed on the wall a photograph autographed by someone described as the World’s Strongest Man. The accompanying yellowed clippings indicated the fellow was from Vancouver. He kept Doug Hepburn’s name and story in his mind. Hepburn was born with crossed eyes and a club foot. A botched childhood operation left him with a limp. He took up weightlifting in response to schoolyard bullying. Still unknown even in his hometown, he became a laughingstock when he tried to raise funds to attend the world weightlifting championships in Sweden in 1953. To the surprise of his detractors, he returned as champ at age 26. He was so broke he spent his first night home in a $3-per-night skidrow flophouse. The following year he won the heavyweight gold medal before an appreciative home audience at the British Empire and Commonwealth Games. He never received the accolades and support he felt he had earned. Mr. Hepburn — poet, inventor, dietitian, cabaret singer, reluctant professional wrestler — spent his final years as a self-described recluse, entertaining those few who sought him out with a rambling philosophy. He died in 2000, aged 74. Mr. Walther’s mosaic depicts the strongman lifting with his back six hockey players in skates standing on a platform. He is also shown flexing his beefy right bicep, which is as thick as a the waist of any of us mere mortals. After completion, a sidewalk site will be selected and the mosaic will be imbedded. Like Mr. Hepburn, the artist, too, is an eastside kid. He was born to immigrants from war-torn Germany who met in Canada as young adults. His introduction to mosaics came courtesy of his carpenter father, who brought home from construction sites leftover boxes of tiles, some of which he used in the top of a homemade coffeetable. The boy also accompanied his mother on visits to the Blue Boy Motor Hotel at the foot of Fraser Street, which boasted a bowling alley. The hotel’s exterior included a tile rendition of the figure from the Gainsborough painting from which the lodge took its name. 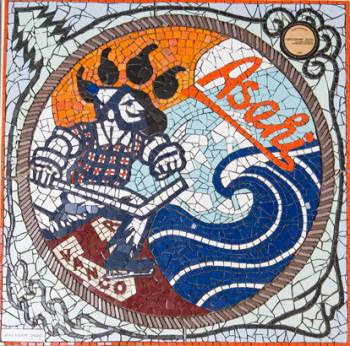 When the business group launched its public art project four years ago, Mr. Walther and Ms. Calvin were commissioned to design, produce and supervise the installation of the mosaics. While they were talking, Mr. Walther realized it was her late father who had been his high school art teacher. Bruce Walther's mosaic titled "Walk of Champions," which honours Vancouver's victorious sporting teams. Following my meeting with Liz and Bruce, I have been working on a mosaic project you might be interested in. This is a community arts project done in collaboration with artist Yoko Tomita. Please follow the links below and feel free to let us know of any further questions.